Eighteen protesters were arrested at the Enbridge pumping station in Westover on Wednesday morning, ending a six-day-long occupation of the site by a group that opposes changes to how it's used. Eighteen protesters were arrested at the Enbridge pumping station in rural Hamilton on Wednesday morning, ending a six-day-long occupation of the site by a group that opposes changes to how it's used. In a statement, police spokesperson Debbie McGreal-Dinning said the protesters were "arrested without incident" and told CBC News in Hamilton earlier in the morning that some people were allowed to leave on their own. Graham White, a spokesperson for Enbridge said the company gave protesters "ample time" to leave the site after an injunction was issued on Tuesday. "It was done in a quick, efficient and peaceful process," he said. Candace Gayle, one of the protesters who was allowed to leave the site, said that police moved in at about 7 a.m. Wednesday morning "maybe a little earlier." About 20 minutes after the police cars got here, a whole bunch of machinery came, starting with a back hoe and then trucks, many of them with Enbridge logos on them. "They're taking people from the back [area of the site]. People are concerned they [Hamilton police] will be rough," Gayle said. She added that she didn't think that anyone had been hurt. "They had told the police liaisons they would give people a chance to leave," Gayle said. "They didn't. They started arresting people who wanted to leave. That was surprising because of what we had been told by police." "It was all really fast, then I just started packing up my bags and almost immediately the police were there, and the first thing I saw was them handcuffing people." "About 20 minutes after the police cars got here, a whole bunch of machinery came, starting with a back hoe and then trucks, many of them with Enbridge logos on them." "We're glad that they're taking the protesters away. It's been rather busy around here, we're used to having a nice quiet little hamlet with a lot less traffic. We hope to have our peace and quiet back again and have Enbridge continue their work." "Three of them have encased themselves in a makeshift structure that is heavily chained to the facility fence," Prychitka said during a noon hour press conference at the site on Tuesday. "These individuals will stay in place as long as they can with the intention of stopping further construction on the Line 9 pipeline." "This is not Enbridge's land to order us off of. 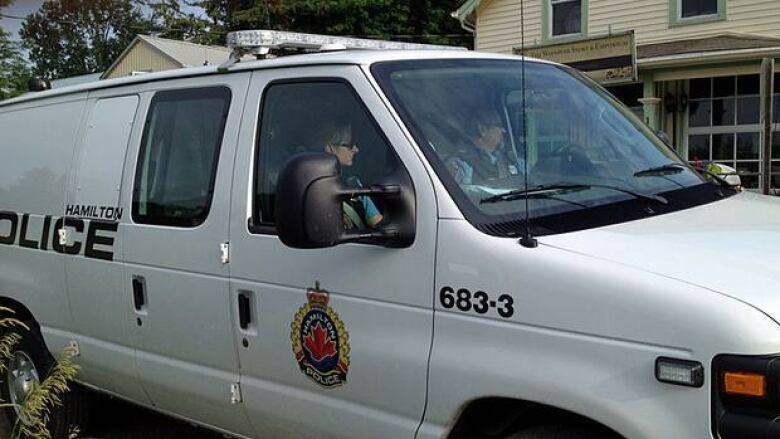 It is stolen," said the statement, referencing the camp's First Nations partners. "Even if it wasn't, this company and this industry exploit and destroy land. It is our responsibility to stop this exploitation." Protester Elysia Petrone said members of her group experienced "intimidation" from a small number of Westover residents during the occupation. "One farmer came out with his big spray machine and sprayed pesticides right on a field beside where the protesters were sitting. It's a huge intimidation factor." She added there had been trucks "waiting in the parking lot, following protesters and shining their high beams on them." "[After the pesticide incident], a neighbour came over and said, 'Sorry for our community member and make sure to wash your hands and your [bottle] of water, and wash your face." Line 9 crosses several major rivers that drain into Lake Ontario and the St. Lawrence River, as well as Spencer Creek, Hamilton's largest watershed. Opponents say the pipeline will carry diluted bitumen from Alberta's oil sands, which is heavier and puts the line at greater risk of a rupture. Petrone said the protests have helped "make more people aware of the concerns and risks surrounding this pipeline."